Pacific Nuclear Transport Limited (PNTL) is owned by International Nuclear Services (68.75%), Orano (12.5%) and a consortium of Japanese nuclear companies (18.75%). It operates as a subsidiary company of International Nuclear Services and its fleet is managed by Serco Limited. 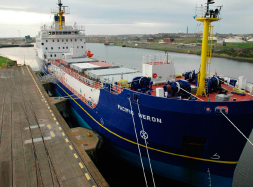 It is the world’s most experienced shipper of nuclear cargoes and has three ships that are dedicated to transporting the highest classification (INF3) of nuclear material. This is a classification of the INF Code, which is set by the International Maritime Organization (IMO) of the United Nations. The INF Code regulates shipments by sea of used (spent) fuel, plutonium and highly radioactive waste. In each case, the nuclear material is shipped in specially designed packages known as casks or flasks. The ships have safely covered millions of miles and there has never been a single incident resulting in the release of radioactivity. More than 2,000 casks of nuclear material have been safely transported by PNTL. Over 2,000 casks of nuclear material have been safely transported by PNTL.